For those of you who don't know Medium, it has become popular amongst creative people and focuses on a collaborative writing experience with a very clean and simple user interface. I couldn't embed any content in a post. Not even that tweet. I couldn't track referrers to know where my readers are coming from. I couldn't search Twitter for my posts because of the massively shared domain. I couldn't even use gaug.es. I couldn't pick my own URLs. I couldn't do anything but keep writing. 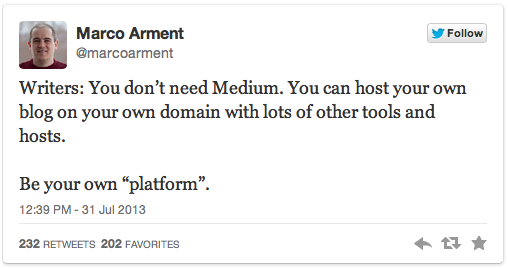 Now some of you might ask: but what about my content on closed platforms such as Tumblr or Squarespace? That's a valid question but Tumblr's acquisition by Yahoo! earlier this year resulted in lots of import tools by other services and the internet community for example. Most of the mentioned companies also allow you to export your data at any time which you should look out for when evaluating your next home on the web.